Chana Klein, Tupperware Consultant, has helped many kallahs start their new kitchens on the right foot. Get your kitchen organized with Tupperware kitchen gadgets and containers. 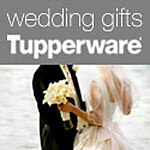 Contact Chana in person or order through her Tupperware website, where you can also open your Tupperware wedding gift registry. Get more for your wedding! Don't forget to mention ChossonKallah.com when visiting Chana Klein - Tupperware Consultant.